Valentine Smiley Collection for PostSmile 1.9 is icons software developed by Masterra. Express your romantic feelings with the Valentine Smiley Collection for PostSmile! It includes 9 different sets of animated images and smiley faces. With PostSmile sending emails and posting on message boards gets to be fun. You can Drag and Drop images and animations, smiles and emoticons, text or HTML snippets, quotes and signatures into your email, message board or web-forum postings. This icons software is freeware, which means you can download and use Valentine Smiley Collection for PostSmile 1.9 absolutely free. There's no need to buy the product. 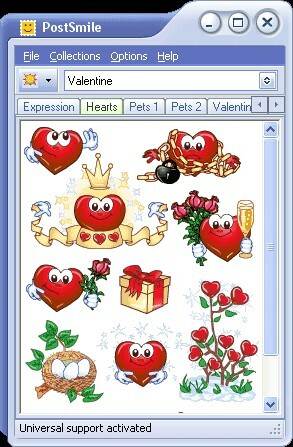 Valentine Smiley Collection for PostSmile 1.9 supports English interface languages and works with Windows 98/XP/Vista. Latest Valentine Smiley Collection for PostSmile 1.9 does not contain any spyware and/or advertise modules, allowing installing it with no worries concerning valuable information loss. We has completely tested icons software Valentine Smiley Collection for PostSmile 1.9 many times, written and published the interesting article and uploaded installation file (1469K) to our fast server. Downloading Valentine Smiley Collection for PostSmile 1.9 will take minute if you use fast ADSL connection.